My father-in-law dropped off some short-cut bacon that was on sale at one of the big chain supermarkets for about $8.00 per kilo. 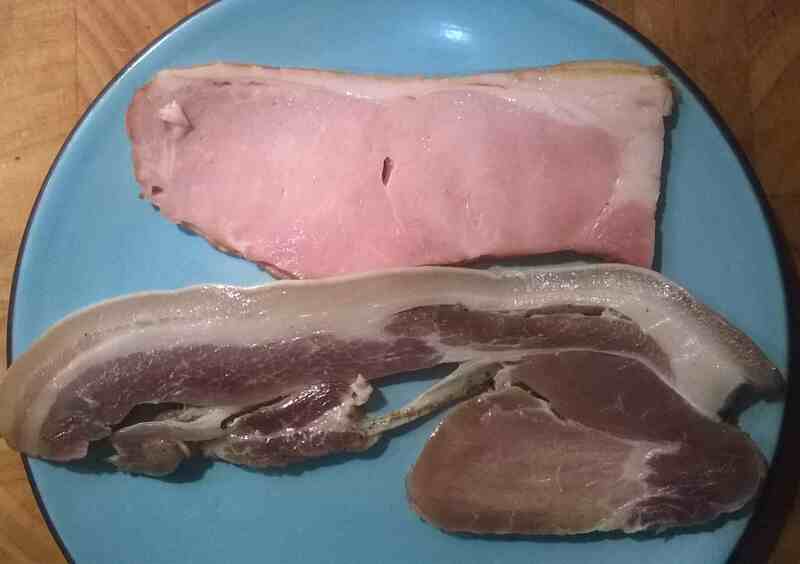 It proved an opportune moment to do a side-by-side comparison of my latest round of bacon against its commercial counterpart. I had to cut my bacon extra thick, as the hanging had caused the meat to move out of alignment with the fat and rind. 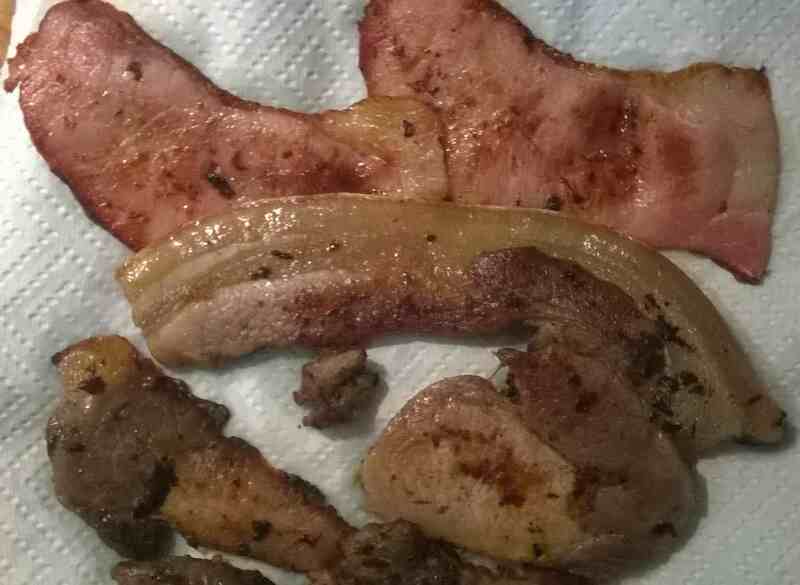 Pictured above is the first slice of my bacon sitting below 2 slices of the commercial short-cut bacon. The differences are pretty obvious. Firstly, the commercial bacon has a much nicer colour, which is achieved through the addition of sodium nitrite in the curing process. Sodium nitrite also changes the flavour, allegedly giving bacon its ‘characteristic’ taste, whatever that means. In case you’re wondering: yes, a nicer colour is part of the rationale for adding sodium nitrite, though it also extends the life of the product. Secondly, the commercial bacon is much more moist. My bacon was dry-cured, which (intentionally) leaches out water over a week, so that the meat can eventually be hung to air dry. The commercial bacon has to be refrigerated or frozen, and is likely made using a brine – with some manufacturers injecting the brine into the meat to speed up the curing process. As more traditional manufacturers point out, it’s much more cost-effective to sell by weight when your product is composed increasingly of salt water. The water composition of the bacon changes how it cooks, as well as the texture, storage options, and value for money. The Woolworths page states that their bacon is 90% pork, minimum. So at worst, 10% of the bacon you purchase is composed of brine. By contrast, my first batch of bacon lost 24% of its weight during the curing process as it leached liquid. I soak my bacon in water for at least half an hour before cooking to wash out some of the salt, and some of the water content is reclaimed at the same time. Compared to the commercial bacon, when cooked, my bacon looked more like a pork steak. It even tasted more like a pork steak, with thicker, tougher and more dense slices of meat that maintain a texture we don’t usually associate with bacon. Even the thinner slices had that ‘meaty’ feel to them. The flavour likewise was much more like cooked pork than the commercial bacon. Aside from the mysterious influence of the nitrites, the major difference between my bacon and the commercial bacon is that the latter is smoked, whereas mine is unsmoked. Now, I’ve had properly smoked bacon from a local butcher before, and the taste is amazing. A single rasher in a saucepan full of bolognese sauce will totally change the flavour. By comparison the regular commercial bacon has very little flavour from its smoking. Yet alongside my unsmoked bacon, I think the smoke is enough to distinguish the commercial product. I’ve tea-smoked a chicken on my stove before, so I know that even a short smoking can impart incredible flavour to meat. I’m therefore confident that if I was to smoke my bacon before air-drying it, the result would easily overwhelm the commercial product. But as it stands, there is too much difference between my unsmoked bacon and the commercial, smoked variety. I have to admit that as bacon, my product doesn’t quite hit the mark. Until I am able to smoke it, it would seem best to continue to refer to it as cured, air-dried pork. The only question remaining is whether it is worth continuing to cure and dry pork, when a tastier, apparently cheaper substitute is available commercially in the form of short-cut bacon? On its own merits, my air-dried pork is a good addition to various dishes: pasta sauces, soups, stews, and so on. At a cost of roughly $11 per kilo, it is not as cheap as the commercial bacon if bought on sale and frozen long-term. However, the pork used for 75% of Australian bacon is imported from overseas, which explains the low cost. My pork was purchased fresh from a local butcher. It’s also difficult to put a dollar value on the satisfaction of processing the meat myself, and having three or four kilograms of dried cured pork hanging in my laundry for whenever I want to use it. All in all, it seems reasonable to continue making it; but the fact is that I’m not doing all this stuff to be reasonable. I’m doing it because I want to produce something that completely and without qualification defeats the mainstream commercial product. I want it to be both cheaper and laughingly superior to the supermarket offering, such that people try my bacon and quietly weep at having ever mistaken the commercial stuff for the real thing. I’m not there yet, but the goal is clear.